When Lucas, an amateur theater director, tries to become a professional, ends up fighting with Lico, an amateur actor. Things get worse when Lico falls in love with Lena, Lucas's niece, dating her without her uncle's permission. In this film we see three people linked to amateur theater seeking to reach a professional career, but end up involved in a web of comic situations. Directed by Perdigão Queiroga, the film has the participation of Milú (as Lena), António Silva (as Lucas) and Eugénio Salvador (as Lico) in the lead roles. 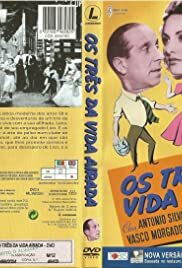 This is perhaps one of the classic comedies of Portuguese cinema with less visibility and more ignored by general public today. For this greatly contributed the overwhelming fame of other films and the poor visibility that Portuguese cinema gets, inside and outside their own country. Nevertheless, its a good movie and worth seeing. The jokes are based, as normal in comic Portuguese films, in funny word games and absurd situations. A film that deserves greater visibility to becomes better known, but which has become a classic worthy of esteem and affection.